It shows the process of making gyotaku from the fresh fish to the finished! 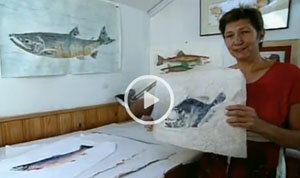 In 2001 Oregon Public Broadcasting aired a segment of Oregon Field Guide about Gyotaku from my studio in Bend, Oregon. It shows the process of making gyotaku from the fresh fish to the finished!